This small collection of articles reviews iconic moments and places of interest that feature on film or in books and songs. Vienna provides the backdrop for a number of books and movies, most famously the Third Man with Orson Welles. 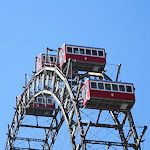 And it’s not the only movie to feature the famous Riesenrad (Giant Ferris Wheel). Hint: His name is Bond, James Bond. Talking of Bond, see which Vienna sights played a major role in the 15th Bond film: The Living Daylights. And talking of spy movies, discover which Viennese locations featured in Mission Impossible 5. And at the other end of the cultural spectrum, the city gets a few mentions in Leonard Cohen’s “Take This Waltz”. Watch this space, as I add more articles through time.